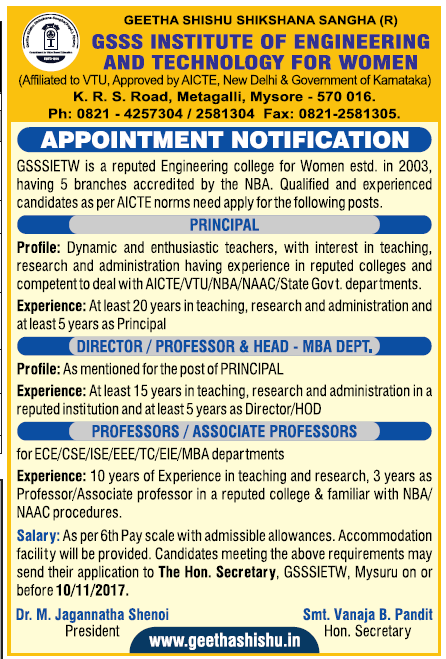 GSSS Institute of Engineering and Technology for Women, Mysore has advertised in the DECCAN HERALD newspaper for the recruitment of Professor / Associate Professor / HOD / Principal / Director jobs vacancies. Interested and eligible job aspirants are requested to apply on or before 10th November 2017. Check out further more details below. About College : GSSS Institute of Engineering & Technology for Women is located in Mysore, the city of Palaces, renowned as a seat of learning. Steeped in history, the city of the Wodeyars, Mysore continues to be the cultural capital of Karnataka. Experiencing moderate climatic conditions throughout the year, Mysore is located in the southern part of Karnataka with an enchanting natural environment, most suitable for educational pursuits. Managed by the WHO'S WHO of Mysore, GSSS(R) is a non-profit organization which is focused towards value addition in terms of providing best of infrastructure and services for the cause of education. Salary: As per AICTE norms. Accommodation facility will be provided for needy candidates. How to Apply: Interested and eligible candidates are requested to send applications with CV, copies of credentials and recent PP size photograph to the college postal address.